We offer several marine construction services including Bulkheads Retaining Walls, Floating Docks, Stationary Piers, Gazebos, Sundecks, Groins & Breakwater, Boat and Personal Water Craft lifts, Pile Driving, & Tug and Salvage. Bulkhead Retaining Walls: These are constructed with the purpose of controlling erosion. Property owners do this to typically slow down land loss and protect property and investment. Stationary Piers: These kind of piers are perfect for oceanfront properties, land right off the waterways, and new developments where manmade ponds, lakes, and channels have been installed. Gazebos: These can be built in several shapes and sizes with various kinds of materials. We can structure a gazebo that’s suitable for an outside dining area, private hot tub use, a community area, and more. The significance of a gazebo reaches further than just adding to property value. Sundecks: These are a great way to add living space to your home. Breakwaters are structures that are designed and built to reduce wave energy by producing a shadow zone, or areas protected by the breakwaters arms. 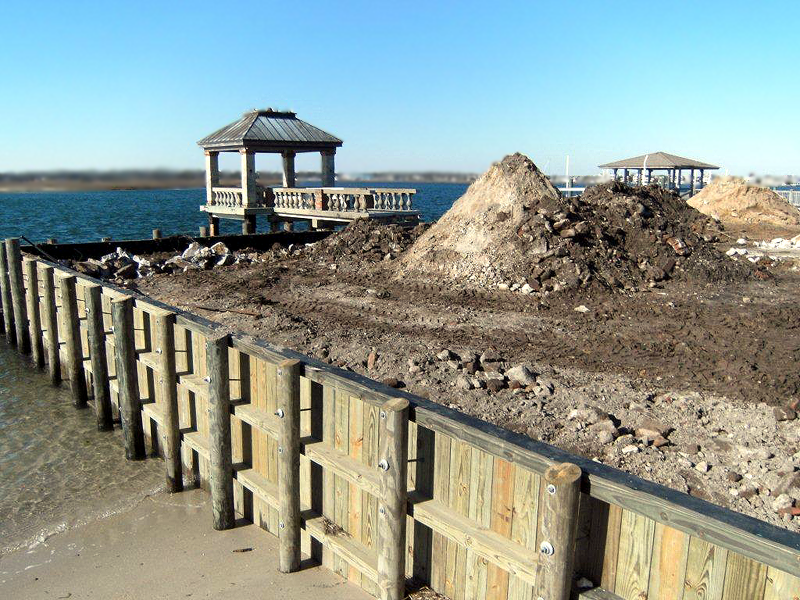 There are two categories of breakwaters: harbor protection and shore protection structures. Breakwaters constructed to protect harbors are typically connected to the shore, while those created to protect shores are usually anchored offshore. Groins produce a widening of beach areas by retaining the sand and sediments in the littoral zone. They also aid in controlling erosion by slowing the loss of natural sediments. Groins trap sediment moving parallel to the shore, maintaining a sand beach. Boats and Personal Water Craft Lifts: If you own a boat or a personal water craft, you need a place to put it to protect it from natural elements. When deciding what kind of lift you need, your most important influences are the craft’s weight and how it needs to be mounted. Lifts can be constructed adjacent to your dock or seawall, or can be installed independently. We will consult with you to find the best fit for your situation and any homeowners association guidelines. Pile Driving: Piers, boat docks, and decks require deep foundation support. Piles, usually made of wood, are used to achieve this. We can drive the piles in and set them so your structure is secure.